How is HTML5 Useful in Rapid eLearning Development? HTML5 is a system for annotating, presenting, and structuring content on the World Wide Web. It is the latest and strongest version of the HTML standard and has an important role to play in rapid eLearning development. 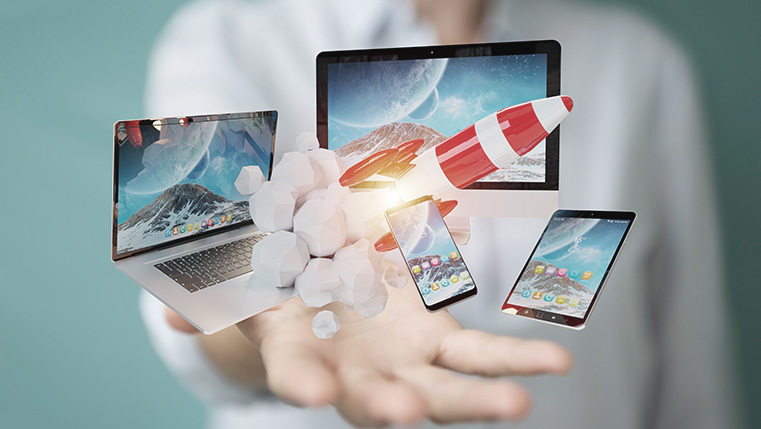 The HTML5 standard is useful in e-learning development as it supports rich media, graphics, interactions, and works flawlessly on mobile phones. With its inbuilt capability to play audio and video, there is no need for additional plugin elements. Even in the absence of Internet, HTML5 has a very good functionality. As more and more e-learning tools and platforms adopt HTML5 elements, we will see an overall consistency in terms of performance. Rapid e-learning development refers to developing online courses quickly and effectively, without having to use overly complicated software or programming techniques. By using HTML5-based authoring tools, rapid development is possible even while converting Flash to HTML5. In these fast global times, where requirements can spring up in an instant and there is a constant struggle to keep costs under control, rapid development comes out as the driving factor for creating e-learning trainings. HTML5 has played an important role in making rapid development the highly effective methodology that it is. Designers have easy to use and more powerful tools that make course development a quick process. What are the Advantages of using HTML5 for Rapid eLearning Development? Quick, custom e-learning solutions are the need of the hour in today’s corporate training scape. E-learning developers can customize the smallest aspects of the training interface and content elements with HTML5. You can effortlessly embed audio, video, and any other graphical elements. HTML5 also supports game-based e-learning content. All of these factors make your custom e-learning course more interactive and effective, in lesser development time. This makes the most out of your training budget and increases your ROI. Developing an e-learning course is not a straightforward task. There are going to be many rounds of changes that need to be carried out in order to satisfy the learning requirements of the client. Courses developed with Flash are difficult to edit, as you need to access and modify the source files that were used to create the course. HTML5 makes modifying any elements of the rapid eLearning course a very easy affair. This future-proofs your e-learning course as the longevity increases due to regular course updates. Updates as well as new courses can be deployed to your global audiences at the click of a button, without worrying about compatibility issues. Gone are the days when you needed to be a master coder in order to develop an effective e-learning course. By using HTML5 based authoring tools, anyone with basic designing and coding knowledge can develop a world-class e-learning course. Of course, you still need a subject matter expert to get the information right, but the designing and development part can be effortlessly handled. Authoring tools offers a simple drag and drop application interface, making customization of courses even simpler. Designers can start creating useful content with the minimum of training and supervision. The usage of mobile devices shows a rapid growth in the e-learning world as more and more people are accessing courses from their smartphones and tablets. Developing courses that are compatible with a wide array of devices is of crucial importance for the success of your learning strategy. The biggest drawback that Flash faced as an eLearning development tool was that it could not create mobile-friendly courses. By using HTML5 authoring tools, you can quickly adapt your e-learning courses to all screen sizes and hardware specifications. Mobile-friendly courses can enable you to reach a much wider audience than simple e-learning courses. Using HTML5 for rapid eLearning development is clearly the way forward for all types of digital courses. Utilize this advanced technology to give your employees the best learning and development experience.